Have a home or building that needs to be cleaned? Have something painted that needs restoration? Have a roof that's grown a coat of algae & mildew? Aqua Blast has been in business since 1997. We are a Wolman-certified wood restoration contractor. As a certified contractor, you can expect us to restore your wood to it's bright clean natural look. We also specialize in concrete cleaning. For residential locations: sidewalks, driveways or pool areas. For commercial locations: sidewalks, drive-thrus, parking pads, dumpster area. We do it ALL! Grease, oil, gum, mold, dirt, paint. We can remove just about anything. Contact AquaBLAST Power Washing, for a solution to all your clean-up needs. Check out some photos of our work for Residential clients and Commercial clients. And the results of our low-pressure roof cleaning have to be seen to be believed. 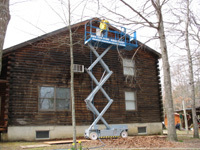 We're experienced, and we can remedy your exterior cleaning problems.